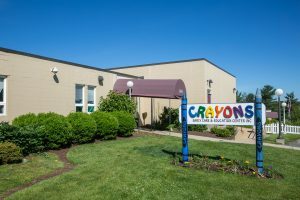 Crayons utilizes The Creative Curriculum® for Infants, Toddlers & Twos as the foundation for our Infant/Toddler curriculum which focuses on providing our youngest students with an engaging, safe environment to promote development, self-confidence and exploration. Caregivers foster children’s language development through music, games and books on a daily basis. Classroom materials and equipment are carefully chosen to provide for children’s safety while challenging and encouraging children’s exploration, experimentation and discovery. Infants have opportunities to develop their fine motor skills as they use their hands and fingers to manipulate materials in a variety of age appropriate ways. They practice emerging gross motor skills such as coordination, movement, balance and perceptual-motor integration as they explore their indoor and outdoor environments. My daughter can’t wait to see her friends and teachers at Crayons each day! She’s having fun and learning so much.